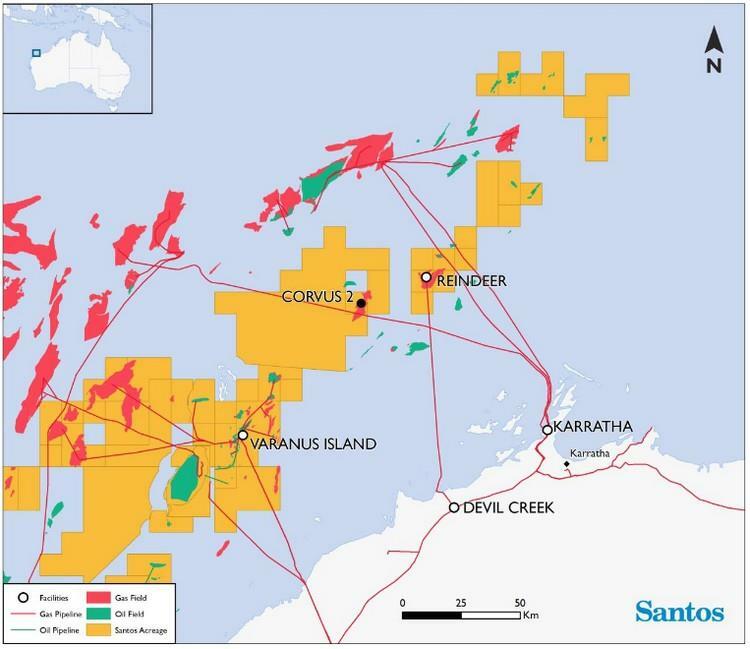 Santos has announced the successful appraisal of the Corvus field, with Corvus-2 confirming a significant gas resource in the Carnarvon Basin, offshore Western Australia. The well, located in petroleum permit WA-45-R, in which Santos has a 100 per cent interest, is approximately 90 kilometres northwest of Dampier in Commonwealth waters and reached a total depth of 3,998 metres. The well intersected a gross interval of 638 metres, one of the largest columns ever discovered across the North West Shelf. Higher permeability zones than encountered in Corvus-1 have been observed from initial pressure sampling completed in the well. Compared to Corvus-1, initial samples acquired from Corvus-2 indicate a significantly higher Condensate Gas Ratio of up to 10 bbl/mmscf and a similar CO2 content of 7 per cent. Corvus-2 is approx. three kilometres southwest of Corvus-1, which was drilled in 2000. The water depth at location is 63 metres. The field is approx. 28 kms from the Reindeer platform, which delivers gas to the Devil Creek domestic gas plant near Karratha, and about 62 kms to a Varanus Island tie-in point. Santos has a 100 per cent interest in all these facilities. 'Corvus-2 has delivered a fantastic result and has opened up a number of additional exploration opportunities in the region. It is particularly exciting to have realised a higher liquids content and significantly bigger resource volume than we expected. 'Corvus could be tied back to either our Devil Creek or Varanus Island gas plants, where it has the potential to increase the utilisation of our existing facilities as well as provide backfill and extend plateau well into the 2030s. It’s a great start to our 2019 offshore drilling campaign, and it also highlights the value of the Quadrant acquisition and our strategy of pursuing upstream brownfield growth opportunities around existing infrastructure. 'The rig will now move north to commence the Dorado appraisal program,' Mr Gallagher said.